A few years ago I read the best book I have ever encountered about the economic system of this country and its connection with war. After reading it, I was left with feelings of sorrow, anger, and more than a little frustration. But today, I decided that the very least I could do about these feelings was to recommend the book in the hopes that understanding the issues will empower people to act. 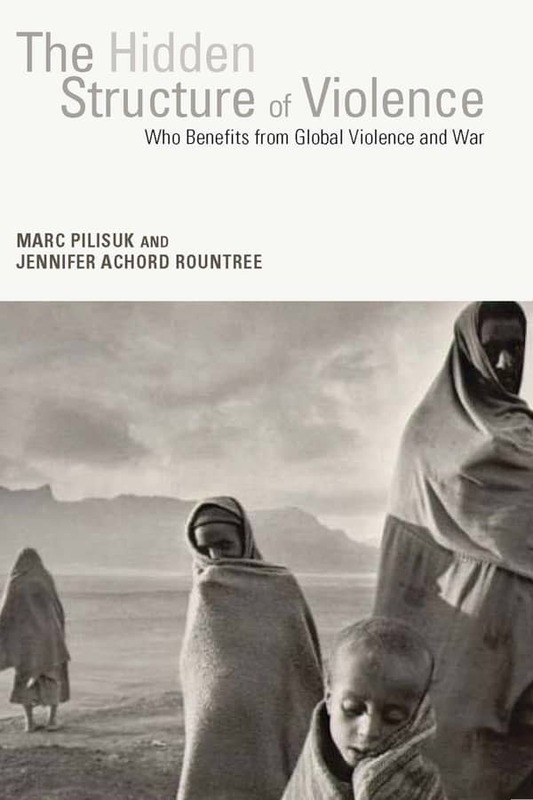 The name of the book is The Hidden Structure of Violence: Who Benefits from Global Violence and War (NYU Press, 2015). First, a word about the authors, because it’s helpful to understand where they are coming from. Both Marc Pilisuk and Jennifer Rountree are connected with Saybrook University in Oakland, California, an online educational institution that examines the interconnectedness of everything and whose mission it is to inspire transformational change. Marc Pilisuk is also a steering committee member of Psychologists for Social Responsibility and a former president of the Society for the Study of Peace, Conflict, and Violence. He is Professor Emeritus of Human and Community Development at the University of California-Davis. Co-author Dr. Jennifer Rountree has a PhD from Saybrook and is research manager at the National Indian Child Welfare Association in Portland, Oregon, where she works in community-based participatory research with American Indian/Alaska Native tribes and urban Indian communities. In The Hidden Structure of Violence, the two analysts look at the way that war uniquely justifies violence, giving a state “the recognized right to order people to conquer, to destroy, and kill.” They examine “the system of interconnected military and corporate elites whose power dominates decisions that affect the use and distribution of resources,” and they describe how the global corporate economy creates conditions that disturb the whole ecological system and threaten all of life on earth. The Hidden Structure of Violence marshals vast amounts of evidence to examine the costs of direct violence, including military preparedness and the social reverberations of war, alongside the costs of structural violence, expressed as poverty and chronic illness. …The result is a stunning indictment of our violent world and a powerful critique of the ways through which violence is reproduced on a daily basis, whether at the highest levels of the state or in the deepest recesses of the mind. Polly Mann is a co-founder of Women Against Military Madness and regular contributor to this newsletter. Note: This article ran in the print edition of the WAMM Newsletter, Volume 36, Number 5, Fall I edition. Go to here to see more WAMM newsletters.